Stock returns show a tendency for small changes to be followed by small changes while large changes are followed by large changes. 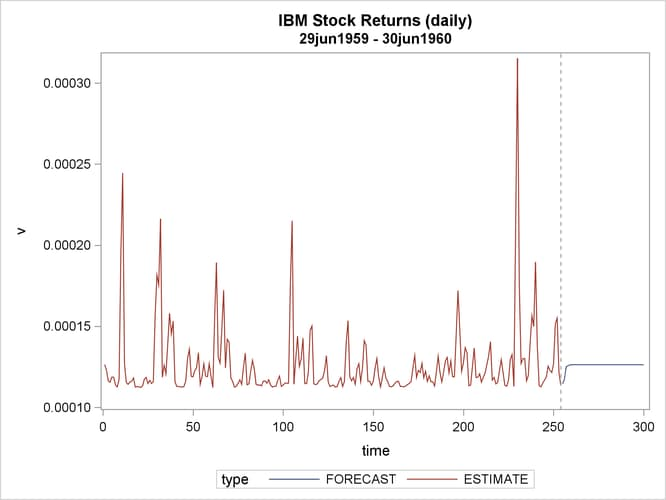 The plot of daily price changes of IBM common stock (Box and Jenkins, 1976, p. 527) is shown in Output 8.6.1. The time series look serially uncorrelated, but the plot makes us skeptical of their independence. With the following DATA step, the stock (capital) returns are computed from the closing prices. To forecast the conditional variance, an additional 46 observations with missing values are generated. The parameter estimates for , and are 0.00011, 0.04136, and 0.06976, respectively. 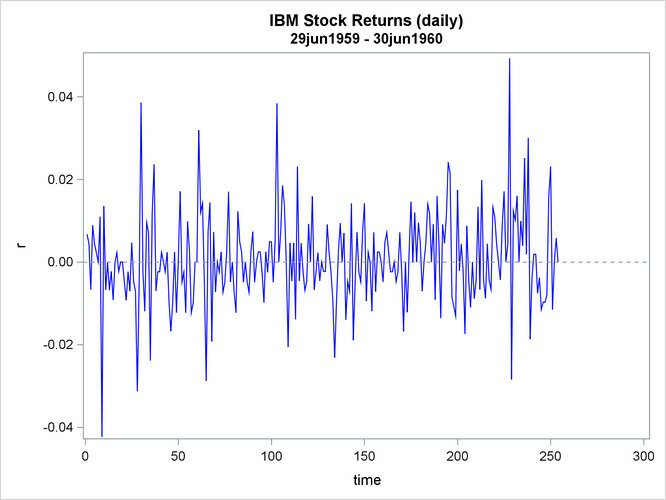 The normality test indicates that the conditional normal distribution may not fully explain the leptokurtosis in the stock returns (Bollerslev, 1987). The ARCH model estimates are shown in Output 8.6.2, and conditional variances are also shown in Output 8.6.3. The code that generates Output 8.6.3 is shown below. NOTE: No intercept term is used. R-squares are redefined.